Your strategy should clearly communicate direction and priorities. Whilst it may take a lot of detailed analysis and discipline to develop and execute a strategy, once it is done it is important to be able to clearly articulate it in a way that people who've not been involved in the detail can easily understand. The strategy-on-a-page (SOAP) is a good technique for communicating a strategy more widely. By sticking to the one-page discipline, it forces the architects of the strategy to really boil it down to its essentials. Here is a template I've used to good effect before. Summarising the analysis underpinning your strategy into a small number of pithy facts about the current situation will help to ground it in a world your audience already understands. Between 4 and 6 statements should provide sufficient clarity without losing focus. You probably don't need a vision and a mission on your SOAP. Either will do. Just pick the one most likely to capture galvanise people into action. Whilst brand values describe how you want customers and partners to experience your business, staff values describe how you want your team to behave towards each other and customers. You may feel these should be the same and only one set of values is enough. If you do have two, make sure they are clearly aligned. 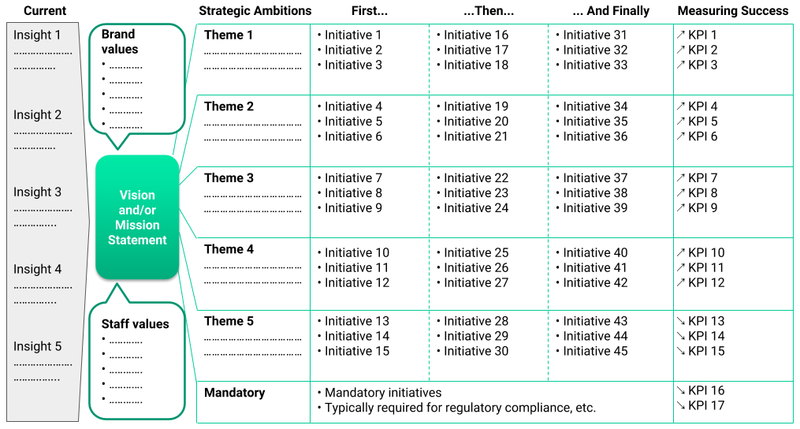 The strategy ambitions describe at the highest level what you want the strategy to achieve, and provide an organising framework for the detail so that it is clear how the individual parts go together to make for a greater whole. Again, between 4 and 6 should provide sufficient narrative whilst retaining focus. Organising the initiatives into "First...", "...then...", and "...and finally" allows you to express the detail of your delivery plan in story-like language without getting overly hung up in the detail. This detail must still be tightly managed, but not on your SOAP. I often see these initiatives chunked up into large programmes. That is fine as a management technique, but it does make the strategy delivery harder for people to relate to. Resist the temptation to fall back on patterns like "First analysis, then design, and finally delivery", as this adds no narrative value. Focus instead on phasing and sequencing of delivered changes. Select a small number, say 2 or 3, KPIs to represent each theme. Use visual icons to indicate, for example, whether you intend for the KPI to be increased, reduced or kept the same. Combine KPIs which represent the change in behaviour of the organisation (e.g. operational changes) with KPIs which show the result of such changes (e.g. growth and financial outcomes). Update your SOAP periodically to reflect progress with the initiatives and KPIs, as part of a programme of celebrating small successes within the context of the overall plan. A SOAP is a powerful tool when used as part of a larger strategy communication programme. It should never be your only communication, though! It can serve as a useful leave-behind. Hang copies around the office immediately after a town-hall or roadshow presentation on the new strategy as an ongoing reminder. Contact me if you'd like this template in Powerpoint format, or need help developing your own SOAP.